Genes From Engineered Grass Spread for Miles, Study Finds. (Business/Financial Desk) Andrew Pollack. Abstract: An Environmental Protection Agency study found that a genetically engineered grass being developed by Scotts and Monsanto easily spreads and breeds with other species, and thus has the potential to cause ecological problems. A new study shows that genes from genetically engineered grass can spread much farther than previously known, a finding that raises questions about the straying of other plants altered through biotechnology and that could hurt the efforts of two companies to win approval for the first bioengineered grass. The two companies, Monsanto and Scotts, have developed a strain of creeping bentgrass for use on golf courses that is resistant to the widely used herbicide Roundup. The altered plants would allow groundskeepers to spray the herbicide on their greens and fairways to kill weeds while leaving the grass unscathed. In the new study, scientists with the Environmental Protection Agency found that the genetically engineered bentgrass pollinated test plants of the same species as far away as they measured --about 13 miles downwind from a test farm in Oregon. Natural growths of wild grass of a different species were pollinated by the gene-modified grass nearly nine miles away. Previous studies had measured pollination between various types of genetically modified plants and wild relatives at no more than about one mile, according to the paper. ''This is one of the first really realistic studies that has been done,'' said Joseph K. Wipff, an Oregon grass breeder. Dr. Wipff was not involved in the latest study but had conducted an earlier one that found pollen from genetically engineered grass traveling only about 1,400 feet. That test, though, used less than 300 plants covering one-tenth of an acre. The effort to commercialize the bentgrass has attracted attention because it raises issues somewhat different from those surrounding the existing genetically modified crops. It would be the first real use of genetic engineering in a suburban setting, for example, rather than on farms. And the grass is perennial, while corn, soybeans, cotton and canola are planted anew each year, making them easier to control. Bentgrass can also cross-pollinate with at least 12 other species of grass, while the existing crops, except for canola, have no wild relatives in the places they are grown in the United States. And crops like corn and soybeans have trouble surviving off the farm, while grass can easily survive in the wild. The bentgrass, moreover, besides having very light pollen -- a cloud can be seen rising from grass farms -- has very light seeds that disperse readily in the wind. It can also reproduce asexually using stems that creep along the ground and establish new roots, giving rise to its name. Because of the environmental questions, the application for approval of the bioengineered bentgrass is encountering delays at the Department of Agriculture, which must decide whether to allow the plant to be commercialized. After hearing public comments earlier this year, the department has now decided to produce a full environmental impact statement, which could take a year or more, according to Cindy Smith, who is in charge of biotech regulation. Ms. Smith, in an interview yesterday, said the new study ''gives some preliminary information that's different from previous studies that we're aware of.'' But more conclusive research is needed, she said. 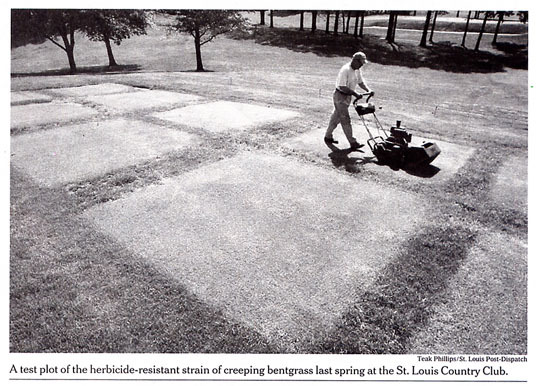 And because nonengineered creeping bentgrass has not caused weed problems despite being used on golf courses for decades, they said, the genetically modified version would pose no new problems. ''There has been pollen flow but it has not created weeds,'' Michael P. Kelty, the executive vice president and vice chairman of Scotts, said in an interview yesterday. He said Scotts and Monsanto, the world's largest developer of genetically modified crops, had spent tens of millions of dollars since 1998 developing the bioengineered bentgrass. Scotts is also developing genetically modified grass for home lawns, like herbicide-tolerant and slow-growing types that would need less mowing. But those products still need several more years of testing, Dr. Kelty said, adding that the company would avoid types of grass that could become weeds. ''We don't want to put a product out there that is going to be a threat,'' he said.